Heavy artillery battles in your living room! 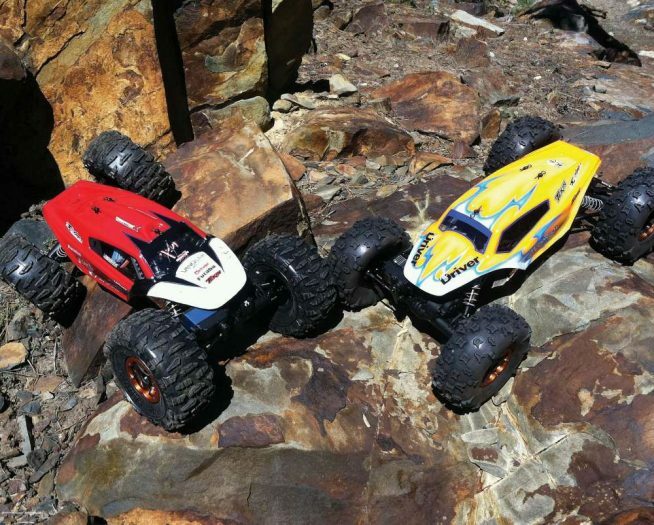 Whether you’re a Battle of the Bulge or a Battle for Ramadi type of RC enthusiast (cough, age), VS has got a machine that’s sure to please. Their new line of VS Battle Tanks feature vast improvements over previous versions, cranking up the fun level to eleven. 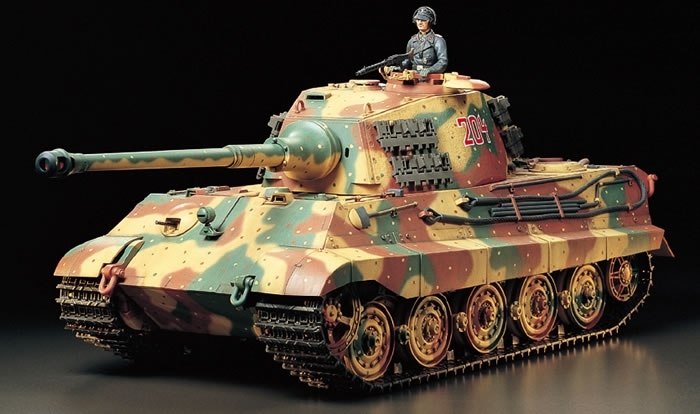 There are a whole slew of different variants available, but for our testing purposes, we were sent the Japanese Type 10 Nato and the German “King” Tiger with the Porsche turret. While these two tanks never would have seen each other in a real battle, they are perfectly primed for heavy artillery warfare in the comfort of your own living room or backyard. If you’re looking for a change of pace from the fast-paced, frenetic world of RC cars and trucks, look no further than the VS Battle Tanks. 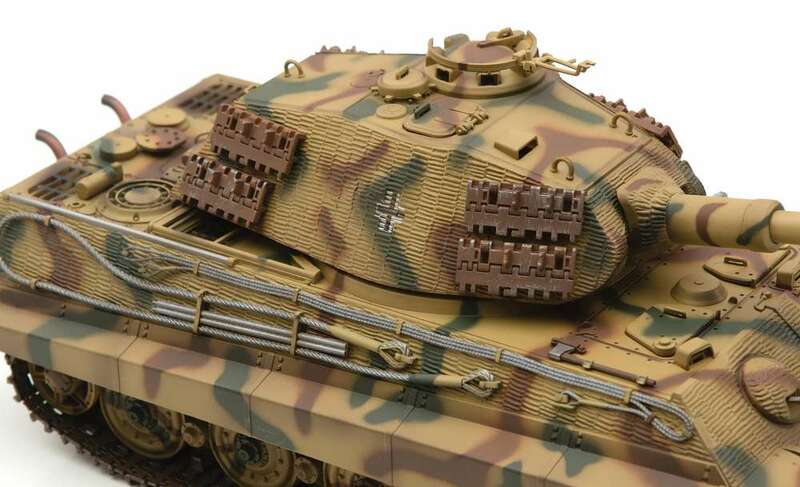 These 1/24-scale machines are accurately modeled after real-life heavy armor from both the modern day and WWII. They all offer full control of the tank itself as well as the turret. The best part is that they each also feature infrared canons and receivers, so up to sixteen tanks can battle at the same time. Get hit up to five times; the tank makes exploding sounds and turret lights flash for a second or two. Get hit that sixth time; your tank shuts down and you’ve now become the spoils of war for your enemy … until you power it back up for another battle! The Tiger II was a beast in its day, striking fear into the hearts of those within striking distance of its infamous 88mm gun. Any Tiger equipped with this weapon could easily smoke allied tanks before the American troops were even close enough to fire. While the earlier Type 1 and Henschel variants of the Tiger were built largely off of the Panther platform, the Tiger II saw vast improvements. The Porsche turret offered better visibility with improved armor and a slope design that was intended to deflect enemy shells. This new machine also saw a revision in motor placement, moving it from the rear to mid-ship, effectively protecting it from enemy fire and giving the Tiger II a better CG. Affectionately referred to as the Königstiger (directly translated as Royal Tiger), the allied forces incorrectly dubbed it the King Tiger. The Japanese Type 10 Nato variant is a modern day design that was years in the making. 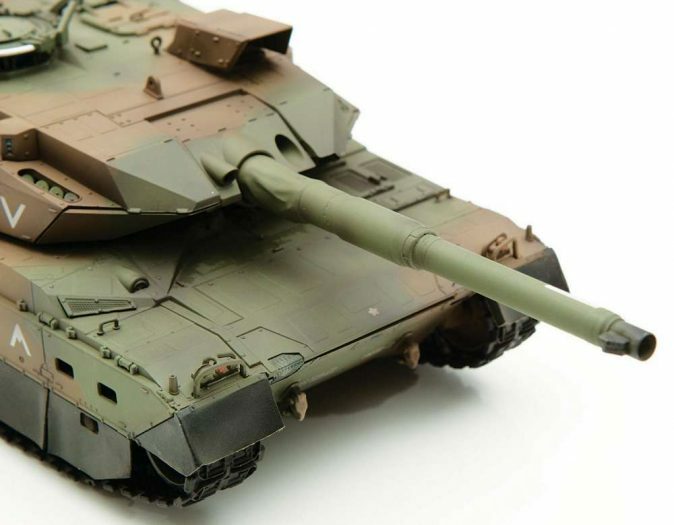 Starting development in 1990, Mitsubishi Heavy Industries set out to design an entirely new machine to replace the aging Type 74 and Type 90 tanks. 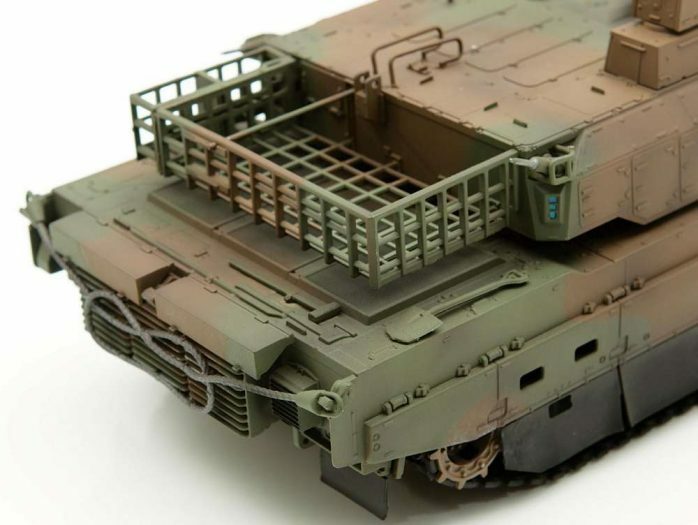 This new Type 10 would be a computer aided, technological marvel that would pack as much punch as any other heavy artillery mechanism on tracks. The smoothbore 120mm canon is capable of firing any 120mm Nato shells and marked improvements have been made to the anti-tank measurements that opposing forces might employ. The all-new modular armor design will aid in the durability and resiliency of the Type 10 while protecting its crew. Lastly, Mitsubishi raised and moved the commander’s position to give him/her a full panoramic view of the tank’s surroundings. 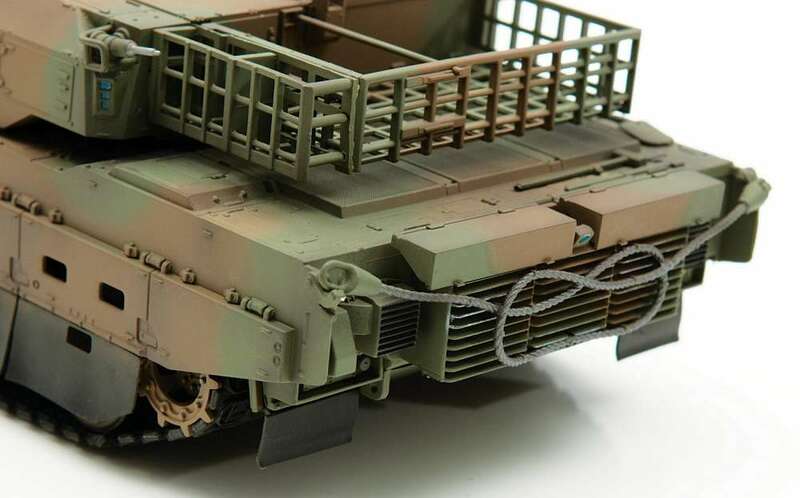 Check out the mud flaps on the side and rear of the Japanese Type 10, along with the rear basket that must be assembled and attached. 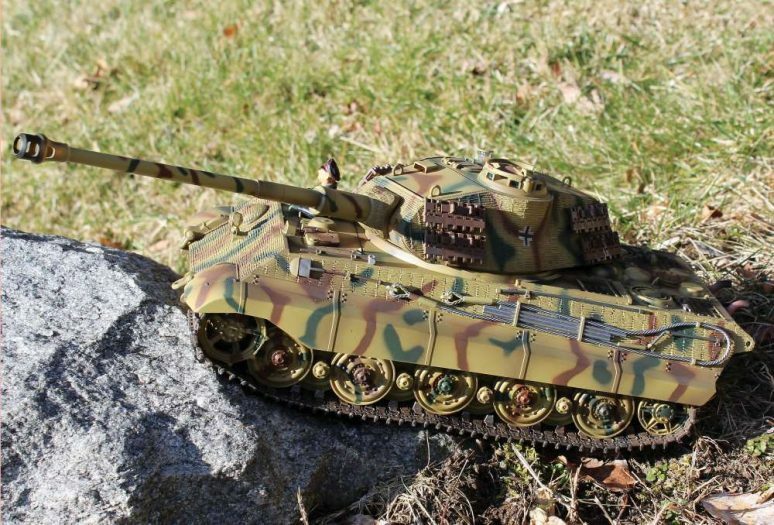 The 120mm smoothbore barrel on the turret of the Type 10 faithfully replicates the real deal. 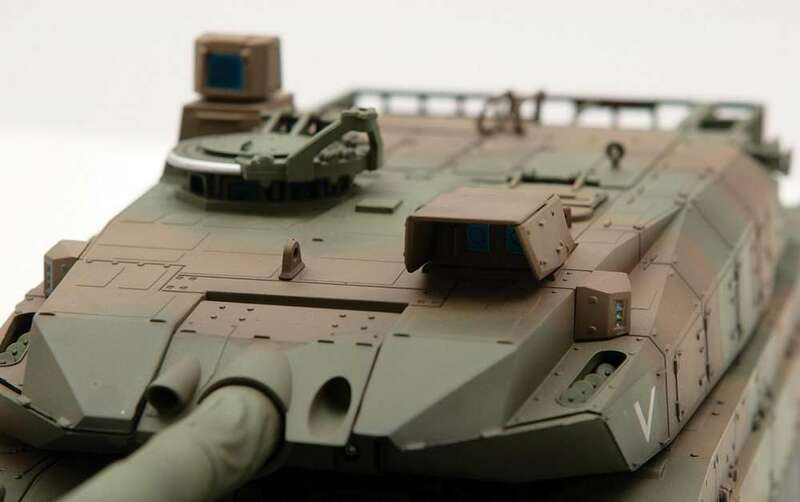 The scale detail featured on all of the VS tanks is simply amazing. The tanks faithfully mimic the full-scale vehicles they represent, but that’s just scratching the surface. 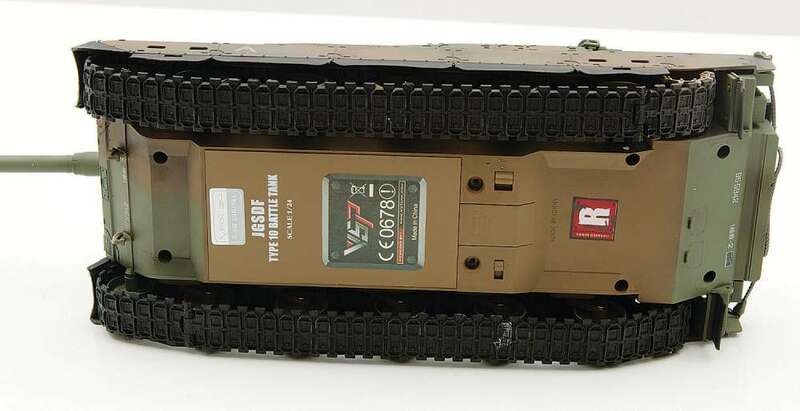 Each tank comes with a Commander figure, has full sound effects, has LED lights front and rear, and with their rubber treads, they can climb a hill up to 40 degrees in incline. 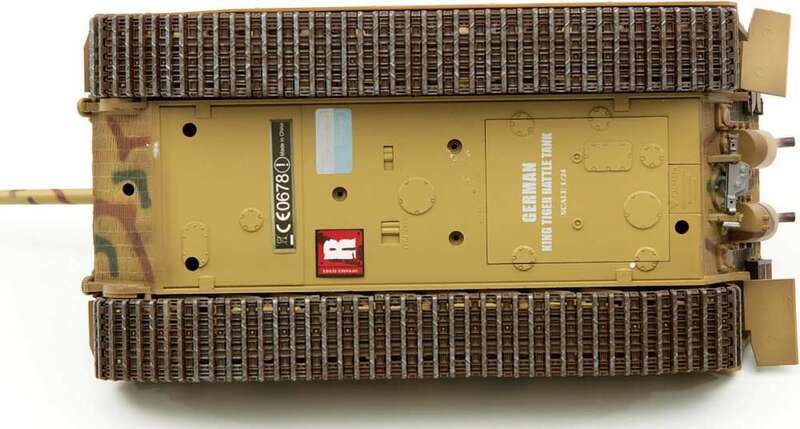 The new 2.4GHz radios that come with the new line of 1/24 models from VS are a step up from the old crystal packing systems. Not only that, but the controls are now fully proportional, so you can weave your way through impromptu battle fields with ease, seeking that elusive enemy. The mighty 88mm gun on the Tiger was the scourge of Allied forces in the European theater. VS Tank drivers have full control of the tur- ret elevation and rotation. The beauty of the VS battle tanks is that you need an area no larger than the average living room to use them. After a quick redesign of the conference room at the RC Driver office, a few carefully placed empty boxes gave us the perfect urban battle environment to test them out. Indoors, the infrared canons will fire up to 26 feet in range, so you don’t have to be right on top of your opponent to score a hit. I enlisted the help of Editor in Chief, Greg V, for an hour or so of play time … I mean work. With a fresh bushel of “AA” batteries loaded into each tank and their respective transmitters, we turned everything on in preparation for the mock battle ahead. Our first thought (as well as everyone’s in the office) was, “Holy smokes! These things are loud!” Luckily, there is a volume switch on the bottom of each tank so you don’t have to wake the neighbors. For the first few minutes, we scurried about, behind the safety of the taller boxes, just trying to get a feel for the controls. Each of the tanks is surprisingly fast, with the Type 10 seeming to be a little quicker on the top end, no doubt due to its slightly lighter weight. Once comfortable, I made the first move and began navigating through the “buildings” to get a clean shot at my unsuspecting prey. I knew Greg’s Type 10 was perched behind a building I was skirting, so I thought it was an opportunity to get a shot in from the side while moving to maintain cover. However, the rotation of the turret isn’t lightning fast. I couldn’t get the barrel turned quickly enough to get a shot off and even worse, his mighty 120mm canon was pointed straight at my pristine Porsche turret. The first blow went to the Japanese, with the Type 10 turret recoiling and sending my Tiger scurrying for cover while explosion sounds came from it and lights were flashing all over the turret. We spent the next hour or so carefully devising plans of attack and in the process, altering the landscape of our box city. The idea, much like a real tank battle, was to get your barrel positioned carefully before deciding to take a shot so that you could fire on the run. This proved effective, with the Type 10 eventually taking the win over the mighty Tiger II in our first melee. Greg scored the sixth and final blow when I made an effort to outflank him with speed, but he was ready. The sixth hit to my tank resulted in a longer cacophony of explosions and breaking parts, finally shutting it down with all the lights flashing. Subsequent tests were performed in a park near the offices and this served as an even better backdrop for battle. Using the natural obstacles, it was almost as if we were back in the hedgerows of France in the early 1940s (though a Sherman versus a Tiger would have been more appropriate). Maneuvering our machines to get a clear shot at each other was much more fun in this environment as we had excellent traction on the grass and dirt. The rocks and trees were immovable, unlike our faux buildings, which proved quite challenging. We did manage to lose a few scale accessories such as mud flaps and turret caps along the way, but were able to retrieve them and snap them back in place after battle. We both thought it was especially cool to climb hills with the tanks. Being able to travel up an incline as steep as 40 degrees is nothing to shake a stick at and the torque provided by the included motor makes hill climbing a breeze. At the end of the day, neither of us was able to score a full six hits on one another because we were having too much fun ripping around, through and over piles of brush. The allure of all the VS Tanks is that they represent their full-sized counterparts in excellent scale fashion. From the detailed hulls to the commander figures included with each model, these little battle machines are works of art, worthy of being displayed on a shelf when not in battle. Certain models also include scale accessories such as machine guns and extra shells. 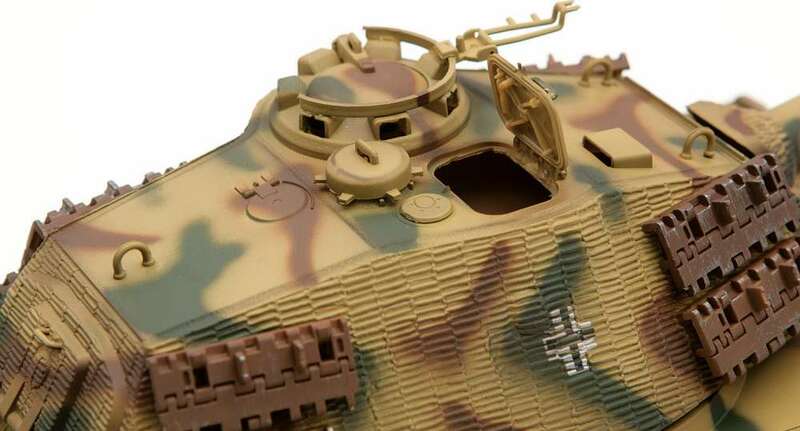 Further enhancing the scale appeal, each model comes with a sound effects module that simulates engine sounds, canon fire and machine gun report. Additionally, the entire turret recoils when the canon is fired. From the remote, you have full control over the tank and turret, allowing for full movement in any direction with the tracks. Once you’ve gotten to your firing location, you also have full up/down and rotational control of the turret (up to 330 degrees) … or you can fire while moving if the shot is yours. The suspension on each of the two tanks is similar, but they do have some differences. 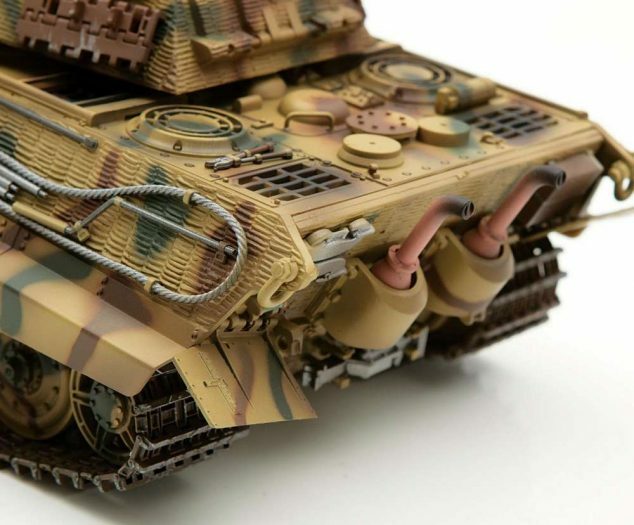 Like the real Tiger II, the 1/24-scale rendering from VS features nine overlapping wheels per side, each spring damped. The Japanese Type 10 uses only five wheels per side that do not overlap, but these are also spring damped. There isn’t much travel at each wheel, but the tanks stay squarely planted on all but the gnarliest of terrain. 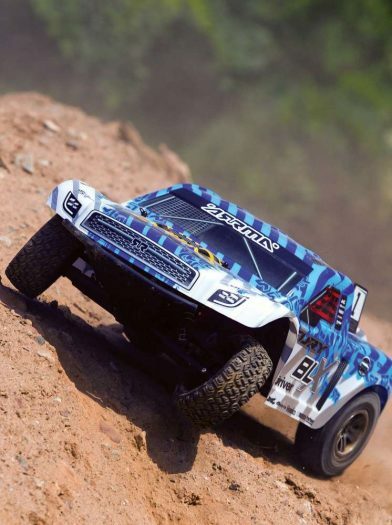 The rubber tracks work well on almost any surface and give the tanks excellent climbing ability with great torque. The beauty of a tank (or any tracked surface vehicle for that matter) is that there is no need for a steering servo or mechanism. The tanks use alternating movement of the tracks to pivot while sitting idle or to turn while moving forward or backwards. The new 2.4GHz transmitters offer full proportional control, but the tanks can get a bit “herky jerky” if you’re too hard on the sticks. They are also a lot faster than you’d expect, so be cautious when using them indoors until you get a feel for their acceleration and braking. 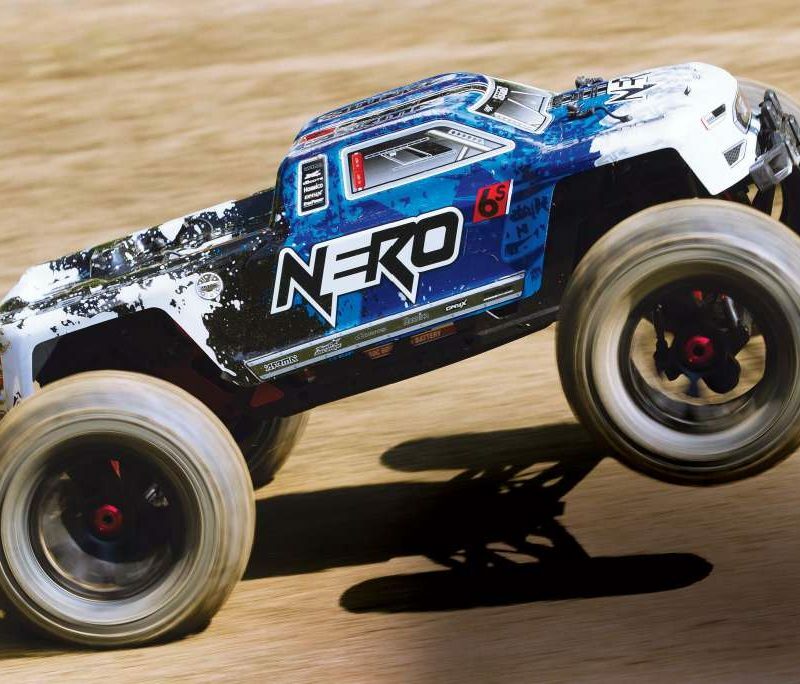 While racing and bashing at a fast and furious pace might be the norm, it’s cool to slow it down and try something different in RC. 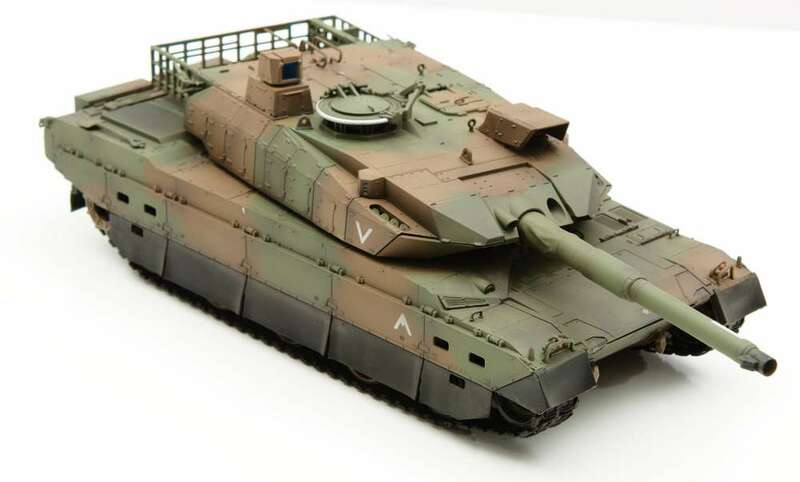 These 1/24 VS Battle Tanks are the perfect tool for lightening the mood and cutting loose without worrying about breaking anything. The best part is that you can play with up to sixteen of your friends at the same time! When was the last time you ran a main or qualifier with fifteen other drivers? The tanks might run on “AA” batteries, but rechargeables are easily sourced and we got a good couple of hours of runtime out of ours, even in some colder weather. 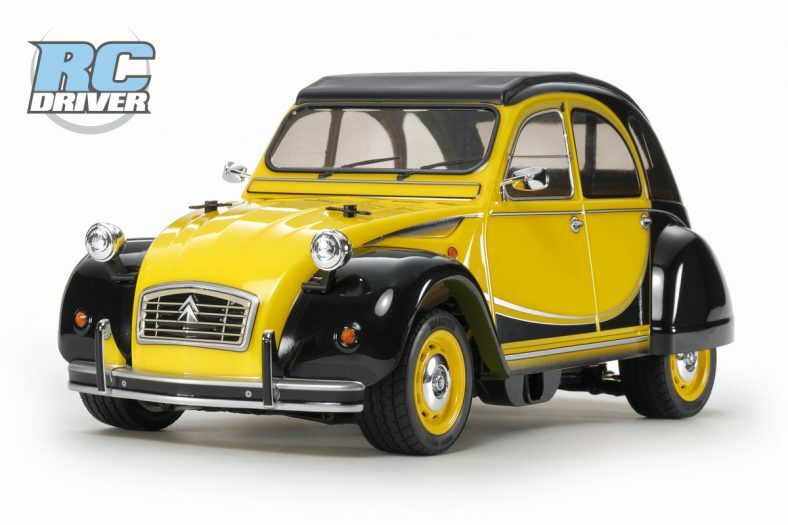 With the vast array of models available, there should be one for everyone so head on over to Hobbico’s website and check them out. Before you know it, you’ll be battling away!